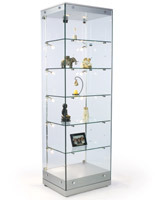 Buy Glass Cabinets From America's Leading Store Fixture Supplier: StoreFixture.com! We Have A Huge Selection To Choose From! Cabinets feature wheels for easy movement! Small footprint takes up little floor space! Locking door keeps items safe! 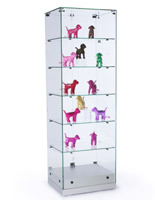 Glass cabinets are available in many different sizes, styles and colors. 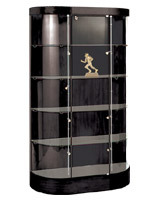 These glass cabinets, also known as display cases, are 22" diameter round showcases. The cabinets are intended to be placed in the center of your sales floor, rather than against a wall, as many other glass cabinets are. 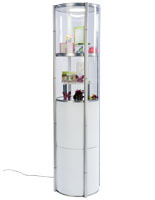 Because of the full-view, round design of these glass cabinets, customers can walk completely around the display cases, seeing products from all angles. 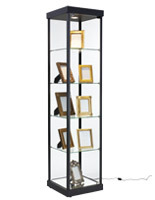 These glass cabinets feature a brilliant silver finish, making them ideal for displaying jewelry, artwork, or memorabilia. These glass cabinets have some great features. One of the most popular features of the cabinets is its wheels. Wheels make it very easy to move the cabinets for cleaning underneath, or rearranging your store. Another great feature is the mirco-halogen side lights. In addition to three 5-watt LED lights that are recessed in the cabinets' canopy, side extrusions hold four additional lights to illuminate products at every level within the glass cabinets. A locking door keeps items safe within the glass cabinets, while a mirror deck enhances products' appearance. 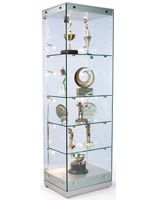 The display cases, glass cabinets are crafted from tempered glass to offer a safe alternative to traditional, annealed glass cabinets. This showcase is a Quick Ship model. In order to reduce lead time StoreFixture has completed 85% of the assembly process in advance. Please allow 4 work days for us to complete final assembly prior to shipping. Our lead time averages only 4 days, not 4 weeks like other vendors! Click here for an instructional video on how to align hinged doors. Click here for a video demonstrating how to receive and uncrate a showcase.